Did you know that Dr. Lisk is the primary on-site dentist at Springmoor — North Raleigh’s award-winning Life Care Retirement Community? Springmoor was the first full service retirement community to open in North Raleigh, North Carolina, and began earning a reputation for quality right from the start. Blending independent living with a full continuum of on-campus healthcare services, Springmoor celebrates an active, vibrant lifestyle with an emphasis on dignity, security and peace of mind. Springmoor is nationally accredited, not-for-profit, financially stable and located in Greystone Village, a beautifully developed area in Northwest North Raleigh. More and more dentists may notice their older patient base increasing in size as adults live — and keep their natural teeth — longer. Oftentimes seniors face unique oral health issues including dry mouth, diabetes, side effects of medications and gum disease to name a few. Dr. Lisk is a seasoned doctor proficient in addressing such concerns in the aging population. 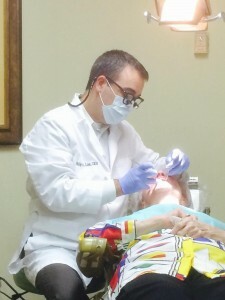 Dr. Lisk offers the same personalized and compassionate dentistry to Springmoor residents that all patients have come to expect in his North North Raleigh office. The majority of Springmoor’s residents drive independently to Dr. Lisk’s office located in Greystone Offices at Greystone Village. For those patients who are unable to visit his main office, they can be seen by Dr. Lisk in a dental office in the convenience of Springmoor’s onsite healthcare building. For those residents at Springmoor that may require more in depth treatment plans, Springmooor or Dr. Lisk will provide transportation to his North North Raleigh Office located at 901 Paverstone Drive, Suite A, North Raleigh, North Carolina 27615. If you or a loved one is a resident at Springmoor Life Care Retirement Community, please stop by and say “hello”. We’d love to meet you and help you maintain optimal oral health.